One of Nyaung Shwe’s longest running mid-range options, Paradise is still one of the best all-round deals in town. It was undergoing a make-over to boot when we last visited. Average rating 8.6 from 122 reviews. The old wooden reception and restaurant has been demolished and while awaiting completion of a new one, the main entrance and reception has moved round the corner just down the side lane. A newly renovated four-storey block houses the temporary reception as well as their superior rooms. Come dry season the rooftop, with some cracking views, will open up as a cafe. Behind this block in a garden are several rows of single-storey chalets divided into two-room blocks. If you want to be picky, interiors are slightly on the faded side and bathrooms are nothing to write home about, but they are spacious and comfortable and all come with roomy verandas. Some rows do look directly onto the neighbour’s concrete wall so be careful in choosing. Decor is basic too but air-con and hot water work well, even if the WiFi doesn’t stretch to every bungalow room. The brick red-painted rectangular block containing the superior rooms lacks charm. Rooms come with equally minimal decor but interiors are sparkling new, spacious and well-appointed. Upper ones come with great views. All rooms have balconies. There’s an outdoor cafe in the garden and a lawn with tables and chairs makes for a pleasant sitting area in dry season. Breakfasts are above average and staff are helpful. Paradise is popular with groups, so book early if you’re after a room in high season. The location is a little bit tucked away down Museum Street but this means a correspondingly tranquil location and proximity to the market. It’s only a 10-minute walk to the main boat piers, too. Check rates at Paradise Hotel on Booking.com. High season their estimate only. 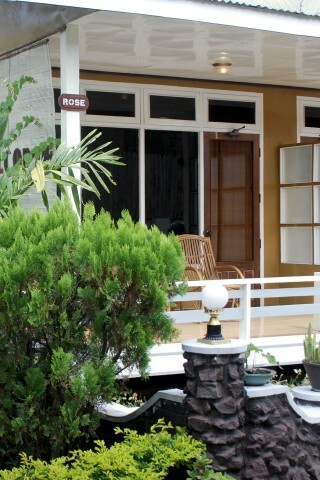 Room: Bungalow fan private bathroom, low season: US$40, high season US$70. Notes: High season their estimate only. Room: Superior double room, low season: US$45, high season US$75. Notes: High season their estimate only.